In a room made from stone and illuminated by candle light, Nelson was sitting on a chair as he stared intensely at the large map of his domain that was unrolled atop of his desk work. On the left side of the desk, his wife Zirconia scanned the parchment she held in her right hand. Zirconia was wearing only a light red tunic in a relaxed manner, while Nelson was wearing a collared patterned shirt and high quality trousers, furthermore a pale brown mantle. This was his attire that he always put on when he was dealing with a visitor. This room was Nelson’s office. It was the same room where he received the report about Grisea Village from Isaac a few days ago. It was just past noon, outside the sun violently asserted its place in the sky however, since this room didn’t have windows, the sunlight couldn’t be felt. On the corner of the desk were several unfolded sheets of documents containing things like the latest information within the territory or the report on the trend of another country that Zirconia had pulled off from the shelf. Zirconia said this while she placed the parchment in her hand onto the pile of other documents on the corner of the desk. Nelson raised his face from staring at the map and looked at Zirconia who stood in front of him. Zirconia who received Nelson’s gaze, took several sheets of documents from the pile on the desk corner and lined them up in front of Nelson. Nelson examine the documents that were lined up, and just like what Zirconia had explained, food aids from Gregorn territory had underwent a sudden reduction. The reason for the sudden reduction was attached to the document. It looks like a famine had breakout on Gregorn territory. From the day the armistice treaty with Balveile was signed into effect until the present day, for Nelson’s territory rather than agricultural reclamation, their domestic affairs were more focused in building construction works like fortresses alongside the border with Balveile or the protective wall surrounding Isteria. Although the situation had gone comparatively well up until last year, this year’s drought brought large scale famine due to food shortage in the territory. For the last several months, by imperial edict, the other territories were sending food aids to Nelson’s territory. Even normally, Isteria received the food for the inflated population for no additional compensation from the other fiefs. However the current outbreak of severe famine was on such an unprecedented scale, that the food amount became insufficient. Nevertheless, with the recently diminished food aids from Gregorn territory, it was a situation where a judgment should be made about whether or not there should be a change on the first policy about putting construction works of defense facilities as its topmost priority. Reading the documents, Nelson couldn’t help to spit out his complaining words. Then after hearing Zirconia words, he let out a long sigh. Hearing Nelson words, Zirconia closed her eyes and thought over it for while. She let out a small sigh and opened her eyes. After entering an armistice treaty with Balveile, Isteria territory pressed forward a policy that put military preparation at the fore, like constructing defensive positions or increasing army strength sufficiency rather than its domestic affairs. Nelson himself wanted to put food production or reconstruction support as the first priority of his territory, however, it was his wife Zirconia who firmly advocated that they ought to increase their war preparations. Of course, the other leaders in Isteria territory including Nelson...... excluding military personnel, everyone was completely against it, however, Zirconia stubbornly advocated it herself and didn’t concede on it. After all, Zirconia persistently explained that considering Balveile’s war potential and its ability to continue the war, if by the time the armistice treaty expired and the territory army scale hadn’t changed it would be disastrous. Because of this, the majority of people who opposed her at first, reluctantly consented because Nelson gave his agreement. Thanks to this the military budget increased drastically at first, however Zirconia herself thought that this amount was still not enough. Every year, in Arcadian nations, small scale famines or floods happened frequently, however presently he large scale famine was something happening for the first time in hundreds of years. If they had put the first priority on domestic affair, the current situation might be more or less preferable, but either way every place might still have suffered large damage. As Zirconia said this somewhat jokingly, Nelson leaned his back on the back of the chair he sat on and made a bitter smile. Zirconia slipped out a chuckle at Nelson who made a bitter smile as she took out a sheet with information about Balveile from the piled up documents on the desk’s corner. Nelson received the document presented to him and quickly looked over it roughly, and with a small furrow in his brow he groaned. What does “Barbarians” mean? It is a generic name for the tribes that inhabited the region located north of Balveile. The tribes of the so called Barbarians didn’t tand united in their actions, fellow tribes frequently had territorial conflicts with each other, and they almost had no concept that can be called a nation. As the aftereffects of those territorial conflicts, the Barbarians descended to Balveile with the intention to attack and take over Balveile’s territory for their own to live in. For the last ten years, Balveile was plagued by this. However, recently Balveile had succeeded in negotiating a peace with some parts of Barbarians tribes. Hearing those words, Zirconia smiled sweetly. After Zirconia said this, she bended at the waist and kissed Nelson. Receiving Zil’s reply like this, Nelson made a wry smile in mild surprise. Zirconia said that and smiled once again to Nelson before saying see you later and left the room. Nelson stared at the door that Zirconia passed when she left the room for awhile, took a deep breath for a moment to psyche himself, and began to write instructional documents for his subordinates. At the time Nelson and Zirconia were busy with their work, Kazura and Valetta were squatting down together in the residence’s garden. They were giving fertilizer to the peppermint seedling plant pots. Nearby those two were paper bags of empty plant pots and herb seed bags that Kazura had purchased in Japan. While Valetta was putting fertilizer with gardening shovel in the peppermint plant pots her nose twitched from their unique scent. For confirming if there was transformation on the fertilizer effect, he orchased 2 types of herbs. Only the peppermints received fertilizer, while the lemongrasses were left as they were. With doing so, he could compare each growth to the other. Kazura confirmed that Valetta had finished putting the fertilizer on the peppermint, and then he took out empty plant pots and herb seed bags from the paper bag. Although for the growth condition experiment using only seedlings were sufficient, but since he had bought a lot of seeds, he decided to raise them all at the same time in this place. There were different kinds of seeds; the ones that were raised in the pot would receive fertilizer, while the ones that were planted on the ground wouldn’t. Assuming that if by any chance the seeds, which were planted in the ground, had massive growth, he had make some kind of flower bed with wood boards so they wouldn’t spread out excessively. The more he raised it the more he could harvest. So, if it had explosive growth, Kazura would feel happy, since if it was possible he wanted to share the harvest with the other villagers. He look at the reference chart of planting season description on the seed bags while sorting the seed bags that could be planted. Most of the seeds had planting season of between April to May, or from September to October. There were few seeds that could be planted on August. When Kazura was going to open the basil seeds bag, Valetta who had read the paper that mentioned the herb raising method that she took from the paper bag, picked up the rosemary and lemongrass seed bags on the ground. Hearing Valetta’s words, Kazura was astonished in his heart. What an awe-inspiring learning ability, to be able read the letters she never seen before in just 10 days. Anyhow, Japanese language’s was written with a mixed of hiragana, Kanji and katakana, so it was difficult to understand. If she didn’t had a very good memory and on top of that, a motivation to learn, then it wouldn’t be possible for her to learn it on such short time. Although they were talking over this, those 2 people side by side diligently put the fertilizer on the plant pots. They also till the dug up soil on the shaded part of garden. While they were talking about herbs or village, they continued their work leisurely. 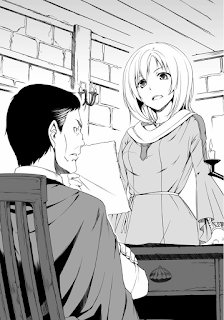 In the middle of their talk, incidentally Valetta turned her face to Kazura. And like that, those 2 people smiled together, once again they were talking while continued their work planting the seed. On the night of the same day. Like usual Kazura was together with Valin and Valetta surrounding the hearth for dinner. The menu for this evening was rice with dried plum, and stir fried vegetables, mushroom, and sausage (from the canned food that Kazura brought). The meal companion was a beverage of herb tea with German chamomile as the base. The subject of the conversation was the herbs that Kazura and Valetta had planted this noon. Last night, Valin didn’t received a detailed explanation about planting herbs, so while they were eating, they were also talking about it. As he looked at two people who enjoyed drinking herb tea, Kazura made a wry smile. Although Kazura was certain that the crops that received the fertilizer he had brought would have sudden growth, it doesn’t mean that it would certainly apply to the herbs that he had brought over his time. However, well, even if the herbs had sudden growth like the crops in this world, since herbs weren’t that different from common grass they could easily grow up. Kazura said that and then stood up, before returning to his room. Then he quickly came back with his objective item in his hand, the sake. Masumi is a local sake from the Nagano prefecture, but somehow it was sold at a supermarket in Gunma, so Kazura bought it. Kazura wasn’t really that strong in drinking alcohol, so he chose Masumi that was relatively easy to drink. Hearing the word “alcoholic drink”, the delighted Valin had a very wide smile. It seemed like he really loved alcoholic drink. Hearing what Kazura had said, the water inside Valin’s cup was emptied in one gulp. Kazura opened the bottles cap, made a small smile to Valin who quickly presented his cup, and poured down the sake in an amount just enough for one gulp in the cup. Valin who taste the sake, he suddenly perceived and thought highly of the taste with great joy. Kazura said this while withdrawing the bottle. Valin had an expression of someone who completely dissatisfied. Valin became sulky after being flatly denied by Valetta’s words. Seeing this spectacle, Kazura who frantically endured the urge to burst into laughter, distracted himself by drinking herb tea. The one who answered Kazura’s question was Valetta instead of Valin who was staring at the bottle beside Kazura. Kazura nodded in comprehension about their stories. Though he had already thought that this world also had alcoholic beverages, it appeared that unrefined alcoholic drink and brewed liquor did exist. As to what had been describe before, Kazura was not really strong in drinking alcohol, but if there was an opportunity he liked to taste a gulp of them. Thus, Kazura saw Valetta and Valin arguing back and forth like this that was repeating about every minute until the 60th times. At the last moment when Valin was getting teary eyes, the ban was lifed. Now, Valin finally could be able to receive a half cup of sake. Kazura had decided to set this devilishly long interval, but Valin, who was entranced by sake, didn’t know about this. Also, I want to make an announcement: I have one week long out of town assignment from Wednesday, 14 October 2015 to Tuesday, 20 October 2015. So no translation on this time period. I will resume the usual translation on Wednesday, 21 October 2015. If I’m lucky, I can finish it on Friday or Saturday. So cross your fingers. So, until then, I’m sorry for the inconvenience. Oh yeah. I don’t intent to drop any translations; I only went out of town for one week.... So don’t worry. The original Japanese raw use “X tenths” term or X/10, not percentage or x/100. Since percentage had been known since Ancient Rome, let’s just go with this until it contradict the raw. It’s “Rucola” for the Italian reader, “Rocket” for UK English reader, “Roquette” for the French reader. It’s latin name is Eruca sativa. Hoo... Boy... The Real Label read: 真澄―純米大吟醸. 真澄 = Masumi: Perfectly clear, crystal clear. This is the Brand Name. 純米大吟醸 = Junmai Daiginjou, Pure Rice, Very Special Brew: A type of特定名称酒 Tokutei Meishoushu or Special designation sake. read this for more information about sake designation. It’s real sake made by Miyasaka Brewing Company (宮坂醸造株式会社). Click here for more information: www.masumi.co.jp/english/. I read that you can buy it in USA (somewhere), if you are interested in trying. I wonder if Susukinokuro-sensei will get paid for this sake endorsement. DON'T LEAVE US ONII-SAMA! YOUR IMOUTO NEEDS YOU! Looks like Nelson is in dire straights. Thanks for the new chapter! Have a great trip! I don't really expect action, I'm curious about how Nelson&Co will react to the potato crops, waterwheel and everything else. If they'll meet Kazura, will the daughter's hand be offered to him? Will she accept because of possible jewels? What about the officer (Ivan?) when he finds out? Ah, be safe on your journey! Thank you for the chapter. As David point it out, I am curios too about those things. Have a good trip. well if the seeds grow explosively better than even the plants that originate there then that would mean that Kazura's seed planted inside of Valetta would produce an offspring that would experience great growth. if the seedlings themselves don't do any bit better than normal but the seeds do, then that would explain a lot. There is a single difference between the two worlds, and that seems to be some kind of rejuvinating force. On earth a tree wont rely on such a force to grow and is self-sufficient. On the other worlda tree would seem to be dependent on that energy. If you take a highly efficient plant to that world it will definitely grow like crazy. If you took a plant from that world and brought it to earth it would probably wither and die because it would require that energy. Its likely to be mana or something similar. Thanks for the chapter. Have a good trip. i wonder if u can post unedited ver.. ? If by the the time I have finished chapter 26 (its relatively short btw) then I'll post the edited part and together with the unedited chapter 25. Am I the only one who is annoyed by the fact how he is researching the growth rate/effect of other worldly products in this "medieval" world? If he wants to experiment with it than he needs in total 4 test groups when using both plants peppermint and lemongrass. Two groups are peppermint and lemongrass both getting the fertilizer the other two groups are again peppermint and lemongrass but this time without fertilizer. One can't research the effect with just using fertilizer on peppermint and not using it on lemongrass since one cannot be sure of the possible effects originated of the specific plant ... reading something like that - I had to cry! And now I need a hug.